Cabin pressure changes the way you perceive taste. Rich flavors become mild. Aromas are subtle. Nuances are missed. That’s why we test all our chefs’ creations under pressure, literally. We bring their dishes into a simulated pressurized cabin, and spend hours there, sampling and adjusting the flavors, so our food can taste its best for you to enjoy at 30,000 feet. Make a reservation for your trip soon. 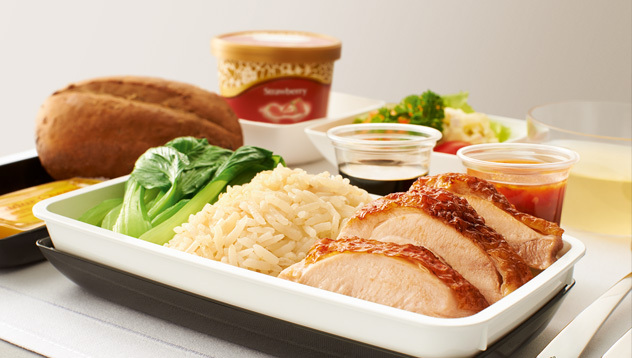 Singapore Airlines is famous for educating passengers in the different palettes of Asian cuisine. The airline serves anything from pecan-crusted veal with red onion marmalade and candied sweet potatoes served alongside vintage Dom Perignon to Chilean bass in oriental sauce with fried rice and mixed vegetables. Another noteworthy dish is braised beef short ribs marinated in five-spice and Chinese wine served with egg noodles and vegetables. To top it off, Singapore Airlines offers desserts as delectable as raspberry tiramisu. Even better? When you have a confirmed booking in Suites, First or Business Class, you may pre-select your main course for all meal services. Pre-selection can be done within three weeks to your flight’s departure, simply log on to Manage Booking with your booking reference to select your meal. Click here to see the options!